There's always controversy where the G&T programs are concerned. Admissions standards, connections, where you live, what language you speak at home, parent education, and many more issues determine whether parents want or don't want G&T in their zoned schools. I'm not going to comment on whether or not I like the idea of tracking that early on, but here's some interesting news about recent developments. According to a "Google Alerts" (thanks for doing the work for me!) I received, the eduwonkette site has a comprehensive run-down of Joel Klein's G&T plan. Check out the site for the calculated results; it's really very well done. But the graph (also from the site) shows the basic problems with deciding if it's "fair" or not. I want to try and look into how it directly affects Sunset Park, but I haven't yet. 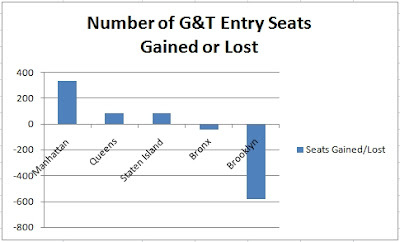 It seems like the less affluent areas LOST seats, which probably means the admissions standards became more strict. As eduwonkette points out, less affluent areas don't have as many resources to "prep" their kids for the testing. And make no mistake, there's a lot of prepping that the kids who get tested go through. So Gifted and Talented often, alright - sometimes, really means "I spent a lot of time practicing for this and my parents spent a lot of dough to get me ready!" That is so sad. I don't even think my H.S. had gifted and talented - I thought that was what honors classes were for?? It just makes me feel sick inside how affluence decides who gets opportunities. It is not the American way, dang it. At least it shouldn't be.